Comfortable and affordable retirement for Lutherans since 1948! 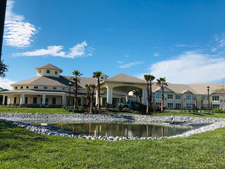 What could be better than an active, care-free retirement in Sunny Central Florida? 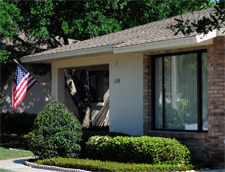 Lutheran Haven, a faith based community nestled in Oviedo just outside of Orlando, offers a supportive environment where an emphasis is placed on spiritual, physical, intellectual and social wellness and activity. Our Independent Living residents are engaged, connected and thriving! We encourage you to browse our new Apartment Home and Cottage floor plans to find your new home and make the move. When asked, our residents will tell you they wish they had experienced the Haven lifestyle earlier. Come join us, there is so much more living to be done! "Whatever amount of activity you would want on the campus of Lutheran Haven, it's all here, available for you, to enjoy with fellow Christians"
The Landings at Lutheran Haven, our new two-story congregate living apartment homes are now open offering 48 apartment homes in six (6) different floor plans designed to offer flexible living. These Life Lease apartment homes offer a simplified, maintenance-free independent living lifestyle with many "extras" included. With the attached Commons building residents will enjoy a carefree lifestyle and amenities. Living in The Landings at Lutheran Haven requires that you be Lutheran and at least 65 years of age. The Cottages, a tradition at Lutheran Haven, offers all of the comforts of home in a "neighborhood" of fellow Lutherans, actively living the maintenance free retirement lifestyle of your dreams. Our close-knit community of one and two bedroom homes - duplexes and fourplexes allows residents to live amongst the 50+ acres of landscaped grounds, sharing the amenities offered on campus and staying active and involved. Living in The Cottages requires that you be Lutheran and at least 65 years of age. What Type of Living Arrangement is Best for Me or My Loved One? Determining the type of living arrangement best for you or your loved one can be a daunting and confusing task. At Lutheran Haven we try and take some of the confusion out by offering you the "What's Best Tool" to help you. If should have any questions about the tool and how it might assist you in your search, please give us a call at 407-365-5676 or toll free at 800-272-5676 to speak with one of our representatives.